Okay that last one doesn’t quite fit and it’s the first one that has pulled me to this page for the first time in weeks. The rest are just part of the warm-up exercise. In one tiny moment today (a moment that lasted less than a single heartbeat … less than a single sharp intake of air), I experienced a disintegration on such an impressive level that the Wachowskis called me before the splinters had even hit the ground to see if they could use my story for the next instalment of the Matrix series. The fantasy that I have actively and wilfully and creatively constructed over the past few months shattered into a million tiny pieces. I watched them float around … like glowing neon green radioactive pixie dust (in truth … very matrix-esque) … before they drifted away on an unseen breeze. A breeze undoubtedly caused by the breath that slid over my tongue, teeth, and lips as I uttered the word “oh”. Now you may have seen this coming. I did not. Honestly. A question. A hesitant answer. A crack in the matrix. It was not what I believed. It is not what I think. It will not be what I had hoped. But I am nothing if not optimistic (call it stubborn or delusional if you will). So … I let those pretty pieces swirl for just a few moments and then started pulling them back together. I began the reintegration process (re·in·te·gra·tion – to restore to a condition of integration or unity). I have a feeling that a piece or two may have escaped before I sprang to action so I fear that the whole I create will be slightly different than the whole that once was. When you look at it, you will know that something isn’t quite right. But it will be close enough. You won’t be able to put your finger on it. You will wonder, but you will move on. And so will I. I am grateful that the sun was shining today. I needed it’s warmth to soften the glue that I am using to hold the fragile and jagged tesserae of this beautiful mosaic in place. Without it, this whole thing might have gone a completely different direction. So here I am. 6 hours post-disintegration and it’s okay. I think I found most of the pieces that belonged. They are staying in place. For now. What I need is really honest conversation to solidify everything. (What I really need is to stop using the word “really” as an adjective). That would be helpful. 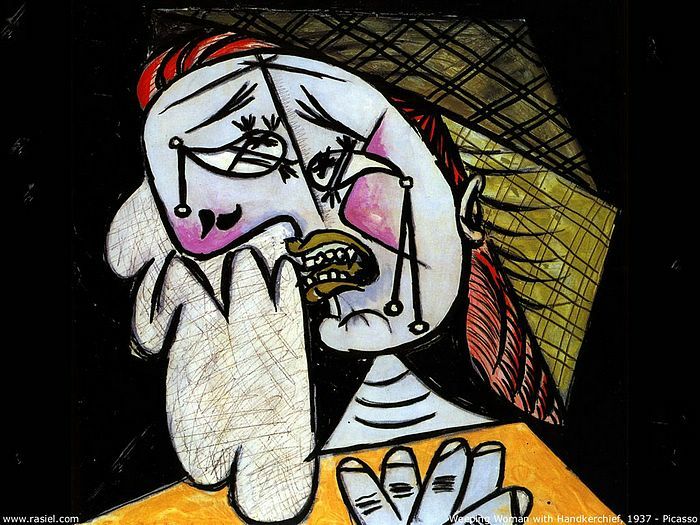 But … I’m okay as a picasso. Realism is boring anyway.